With wine it’s hard to make guarantees, because taste is so subjective. But I’m confident of this: if you like Zinfandel, you’ll most likely enjoy Primitivo. For many years America sought to claim Zinfandel as its own indigenous grape, native only to California. It wasn’t until the 1960s that scientists realized Zinfandel was actually the same grape as Primitivo, which was grown since the 18th century in Italy. For 30 years Italy claimed to be the birthplace of the Primitivo/Zinfandel grape, until genetic testing in the 1990s determined it was actually a clone of a grape native to Croatia’s Dalmatian Coast called Crljenak. So three different names, all describing the same grape! But the name I prefer is Primitivo, so named by an Italian priest who brought it to Puglia from Croatia. The black-skinned grape ripened earlier than the other grapes in his vineyard, and Primitivo translated means simply “first one.” This week’s featured wine comes from a vineyard on the south-east coast of Italy in a commune called Cellino San Marco, dedicated to growing grapes and olives. I can’t speak to the quality of the olives there having not sampled any, but I can certainly vouch for the quality of the wines being produced! This week’s featured wine is called Orion. It’s 100% Primitivo and a truly delicious, fresh red wine that is going to be a hit with California Zinfandel lovers. Pull the cork and you’ll enjoy earthy aromas with spicy fruit and cinnamon, rich cherry flavors, and firm ripe tannins that linger momentarily then disappear. This is a dry wine, not heavy and sweet like many warm-weather Zinfandels. It’s fruity enough to drink by itself, and crisp enough to enjoy with pasta and a nice red sauce. 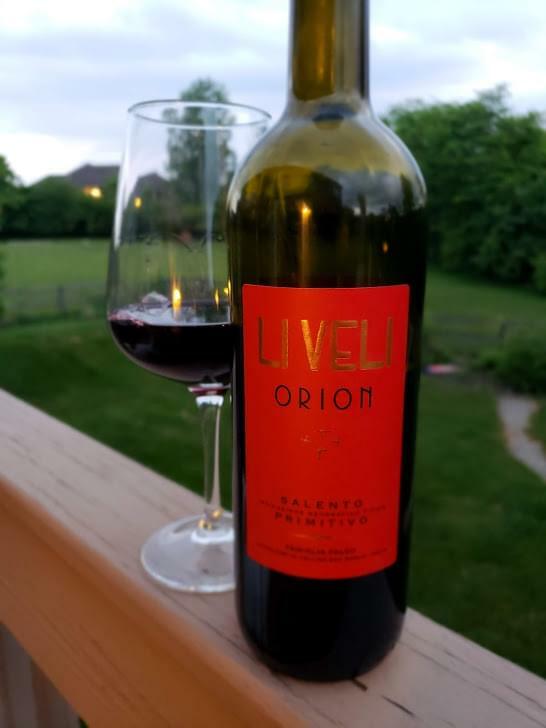 On my five-cork scale based on taste and value the 2015 Li Veli Orion Primitivo gets four corks! This is a delicious, well-made wine that you can find for less than $12 a bottle. Bring it to a party and your Zinfandel loving friends will ask where they can buy a bottle.